The moors are clad in their purple mantle once more as we reach the peak of the flowering season for the heather. It seems a little earlier this year, and if other plants are any indicator it may not last as long as usual following the hot, dry spell we have had. The extremes of temperature this year - the bitter cold of the 'Beast' and the recent roasting - have played havoc with grouse numbers, so for those with an interest in that it is perhaps not such a glorious twelth today. But if your interests lie in walking, cycling or visiting this area in a more leisurely manner the moors really are at their best right now. We always associate the blooming of the heather with two of our local shows - Danby Show on August 15th and Egton Show on August 22nd. Both are well worth a visit - Danby, the smaller of the two, nestles in the dale off the road to Castleton, surrounded by beautiful countryside. Egton, probably the largest village show around, sits on the hill top with commanding views along the Esk Valley down towards the sea at Whitby. Going to either (or both!) gives opportunities to not only see the heather at its best but also to enjoy its wonderful fragrance as it scents the air. 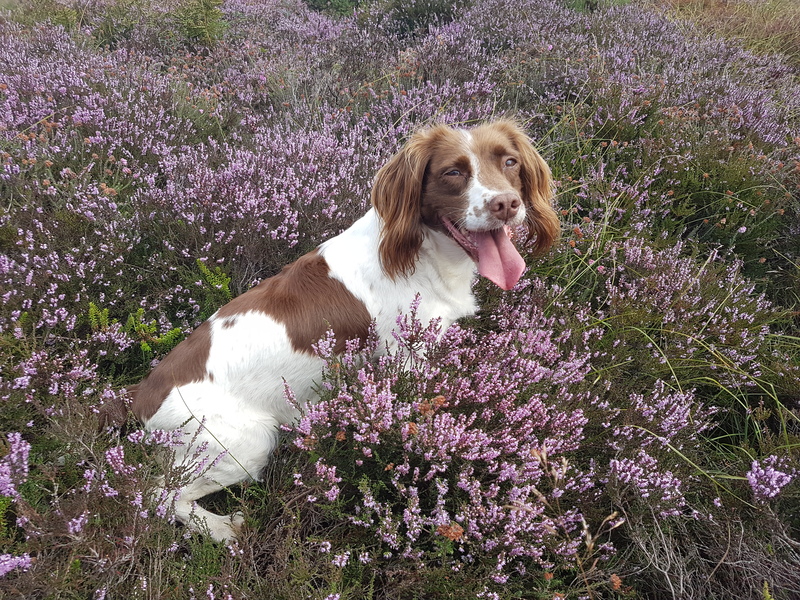 Mya, our Springer Spaniel, loves being out amomgst the heather on the moor just above Skerry Hall Farm on her daily walks. You can enjoy it too if you come and stay with us. Although fully booked until Saturday 18th August, we still have vacancies that weekend and the Bank Holiday weekend. Why not treat yourself to a short break and experience what our guests rave about - see our latest TripAdvisor review, posted today. Booking couldn't be easier with our real-time online booking calendars, which will show you all our availability.